Built by, and employing an impressive ten percent of the population of Miami over the course of those years—Vizcaya is one of the country’s most intact remaining estates from the Gilded Age, when the nation’s wealthiest industrialists built lavish homes inspired by European examples. 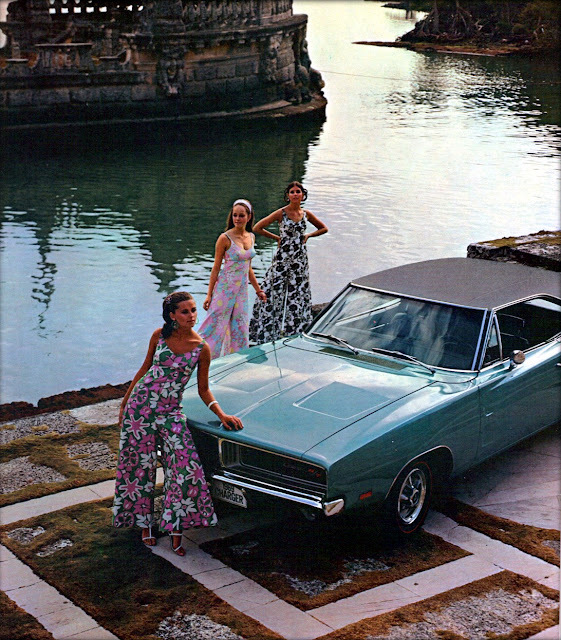 James Deering, Vizcaya’s owner, was retired from his position as Vice President of International Harvester, and his brother and father already had their mansions in nearby Coconut Grove and Cutler. Deering enjoyed his Florida estate for less than nine years. He passed away in 1925 while returning to the U.S. from France. Vizcaya suffered extensive damage in Miami’s 1926 hurricane, and due to old age, his brother who inherited it also passed away and Vizcaya went to his daughters who made it a museum by 1935. They then gave 130 acres of Vizcaya’s property to Mercy Hospital and the Catholic Diocese of St. Augustine in the 1940s; the remaining 50 acres, including the Main House, gardens and Village, were conveyed to Dade County in 1951. Included was the donation of the estate’s substantial furnishings and art collection on the condition that Vizcaya be used as a public museum in perpetuity. 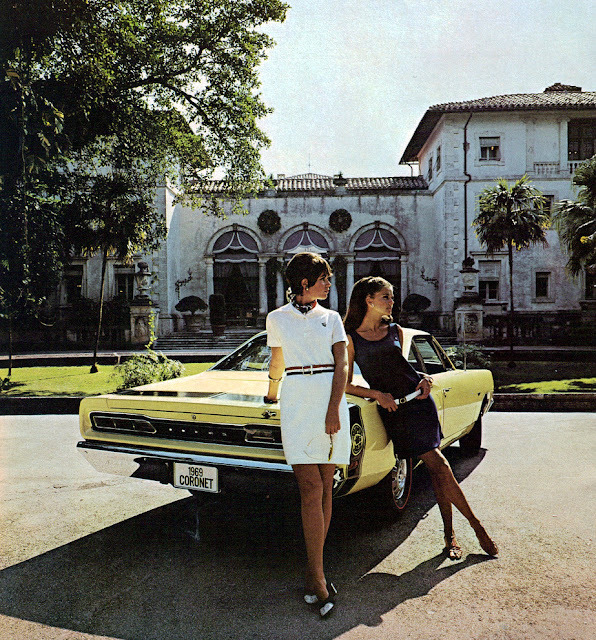 In March 1953 Vizcaya opened to the public as the Dade County Art Museum. 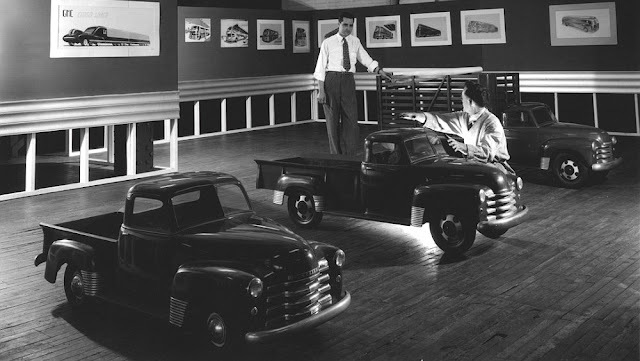 how cool would it be to have one of these factory made concept models?! according to the goofballs Clarkson, Hammons, and May, 85% of water world speed record attempts end in death. 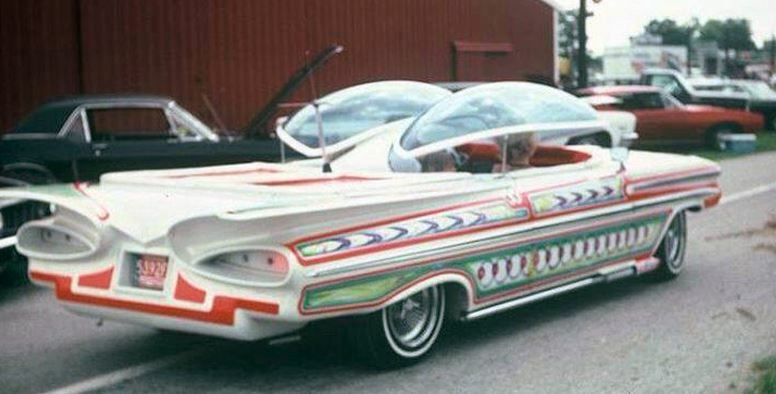 I learn some crazy stuff while surfing through car photos... this little tyke? He's the voice of young Bambi, and went on to a Marine Corps career where he was also a drill instructor. 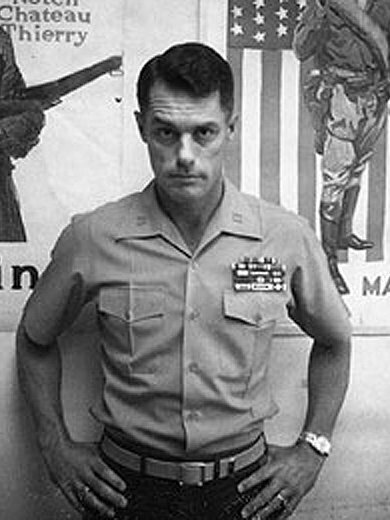 Little Donnie Dunagan, an actor from 38-42, a Marine from '52-77 retiring as a Major. How about that?!!! He enlisted in 1952 and was subsequently promoted 13 times in 21 years — a Corps record at the time, he recalls. 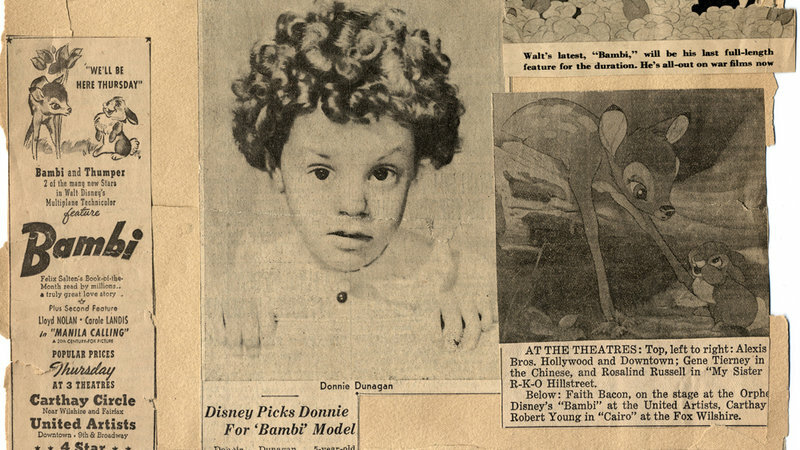 But once, long ago, Donnie Dunagan was the voice of Bambi. He said "bird-a" "flower" and "butterfly", some of the most recognizable lines in all Disney films. Dunagan was born in San Antonio, Texas, but his family soon moved to Memphis, Tennessee, where they struggled with poverty. There at the age of three-and-a-half he won a talent contest prize of $100. Spotted by a studio talent scout, the family moved to Hollywood, where Dunagan appeared in a series of films and soon became his family's main breadwinner. 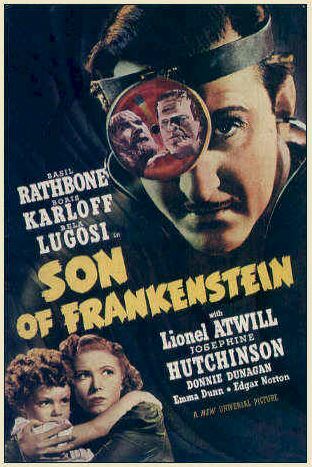 Famous co-stars include Bela Lugosi, Vincent Price, Basil Rathbone, and Boris Karloff. 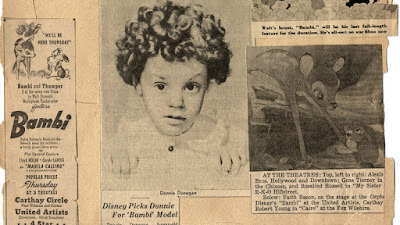 His career height was as the model for, and voice of the young fawn in Walt Disney's Bambi. He recalls the "great ice-cream" they served in the cafeteria and the way Uncle Walt brought real-life deer to the studio because the animators were city kids and had never seen one before. "Mr Disney was a very nice man, very courteous," he remembers. "Some people are the boss because they wear a badge saying 'I'm the boss'. But Mr Disney didn't need that. I had the sense that he was a natural leader." By the age of 13, Dunagan was living in a boarding house and working as a lathe operator. 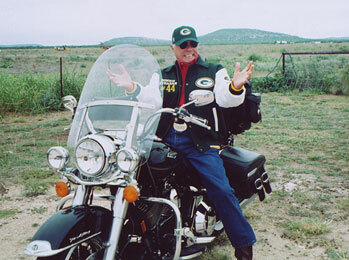 In 1952, at the age of 18, he enlisted in the Marine Corps, became a boxer and Harley rider too. He became the Marines' youngest-ever drill instructor and served three tours in Vietnam, where he was wounded several times in the Tet offensive in Feb '68, then was an instructor at Quantico in combat skills and military law, before finally retiring in 1977 with the rank of Major. 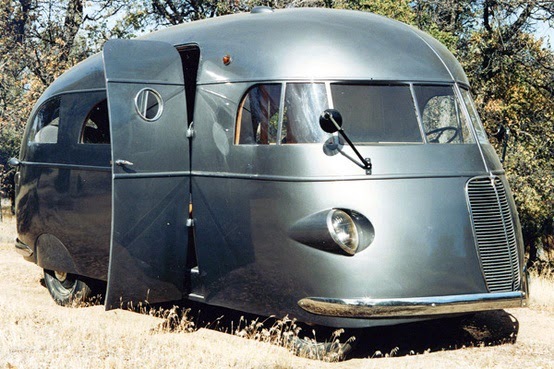 http://justacarguy.blogspot.com/2014/02/i-finally-learned-about-beauty-of-rv.html and this gray one is the only photo I've ever seen of one before, in a dozen years of surfing the internet. The Hunt house car from 1937 used a 1937 Ford truck chassis. 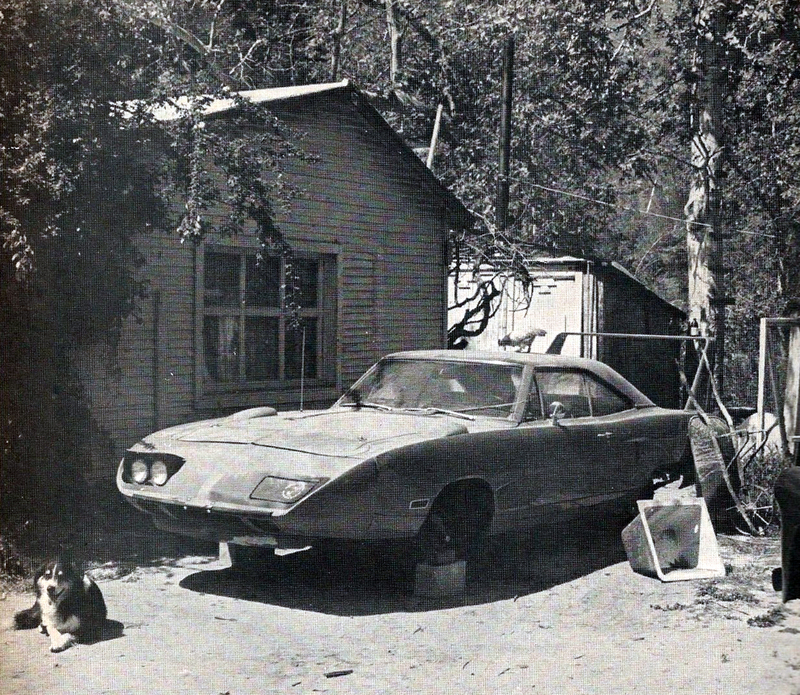 Due to the nature of his work, Hunt spent several weeks at a time away from home. He occupied hundreds of places while practicing his profession and he raced cars and motorcycles for a hobby. 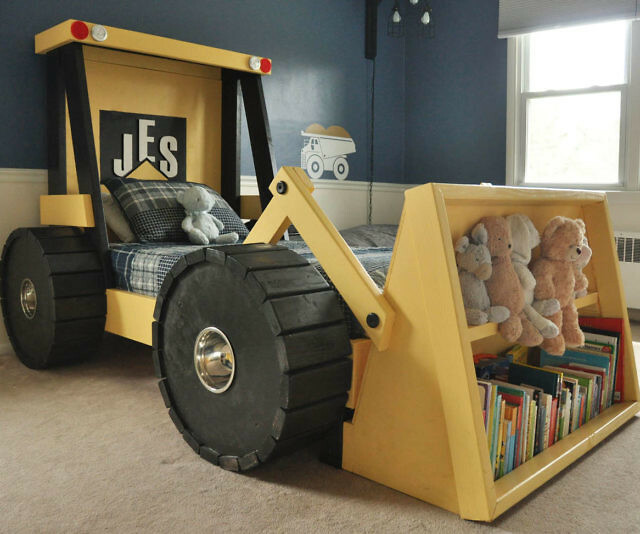 His strangest past time, however, was building RV’s. Currently, the 1937 Hunt House Care is housed at the RV/MH Museum and Hall of Fame in Indiana. 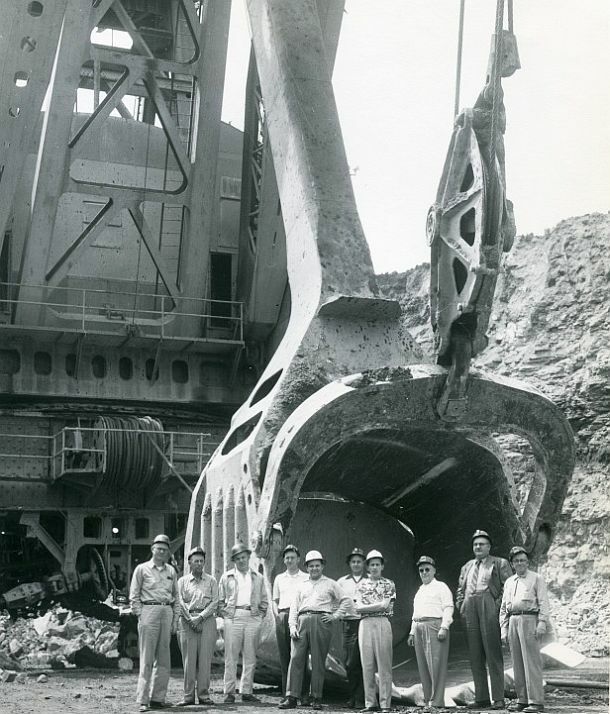 the Marion Power Shovel Co. produced some of the largest earth moving shovels in the United States. 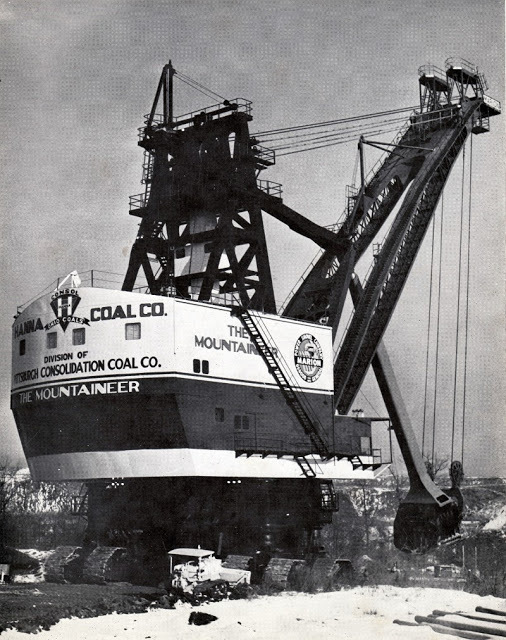 "The Mountaineer" was built in 1955-56 at 16 stories tall and 2.75 million tons, this machine basically started the super shovel era. 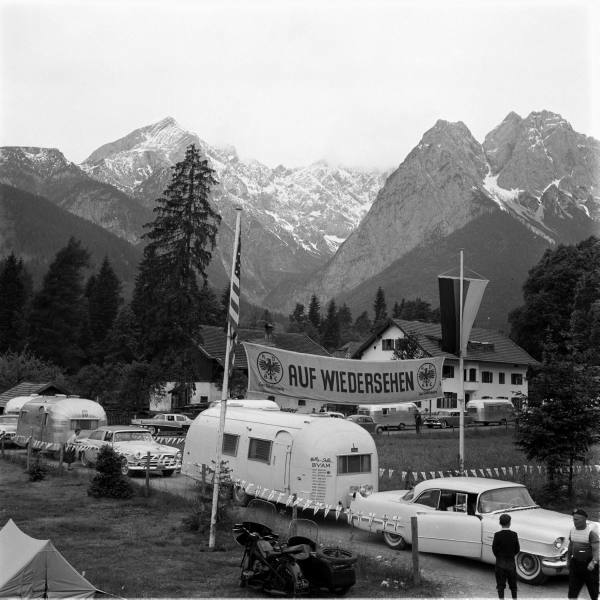 The Mountaineer had a 65-cubic-yard dipper, stood 16 stories tall, with a 150 foot tall boom. 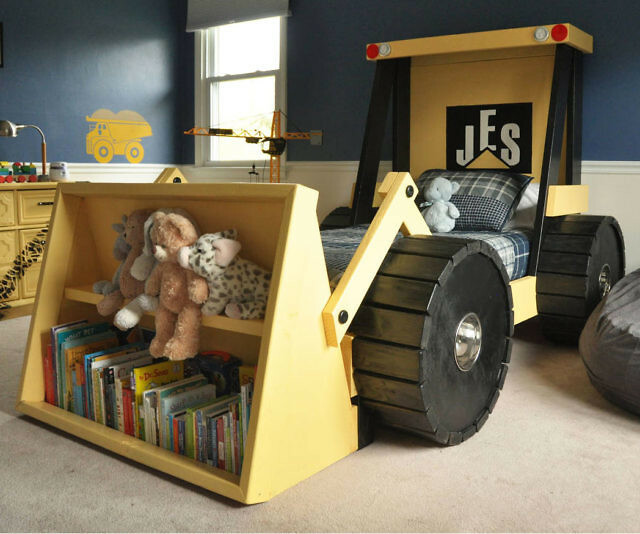 Its shovel could hold a 100-ton payload. 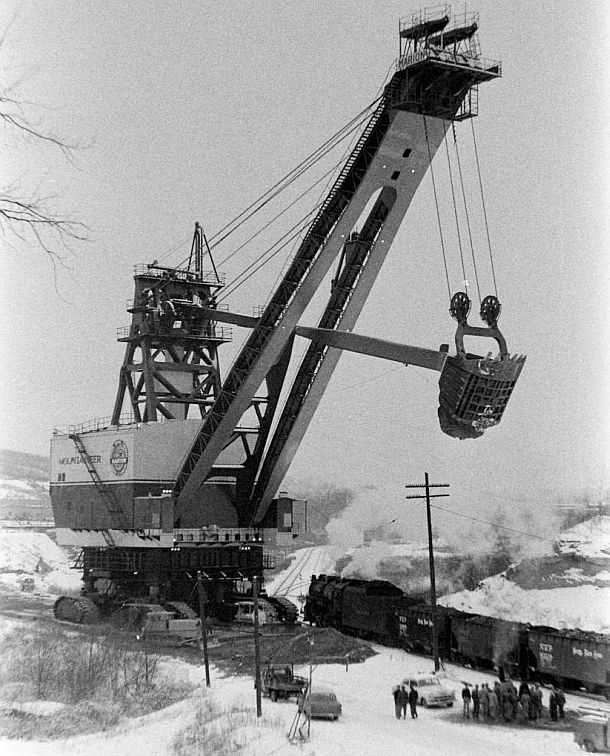 The Mountaineer was the first shovel to have a built-in elevator for the crew to reach the operating controls, in this case, located in dual cabs at the front of the machine, one on each side. Shortly after it's completion on site near the Hanna Coal offices and shops, the shovel was poised next to NKP Berkshire 819 and it's coal train. The opportunity was used to show the massive proportions of the shovel next to the now tiny in comparison steam engine. There were three of the giant machines: The Tiger, The Mountaineer, and The GEM of Egypt. At its deep mine locations, especially in earlier years, Hanna built company housing for its miners, such as those built for workers at the Dunglen mine at Newtown, Ohio. It also operated company stores – those invoked generally by the Tennessee Ernie Ford song, “Sixteen Tons.” Two of Hanna’s stores were those named Dillonvale and Lafferty, and another one was located at Willow Grove, Ohio. First Lady, Eleanor Roosevelt, had visited Hanna’s Willow Grove deep mine in April 1935. The Marion Power Shovel Company also assisted NASA by making the transporters used to carry the Apollo rockets to the launch pad. The various Space Shuttles also used the haulers to travel to the launch pad. 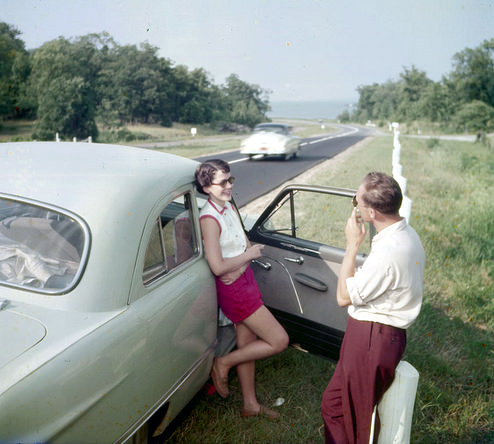 During 1970, environmental concerns continued to rise across the nation. 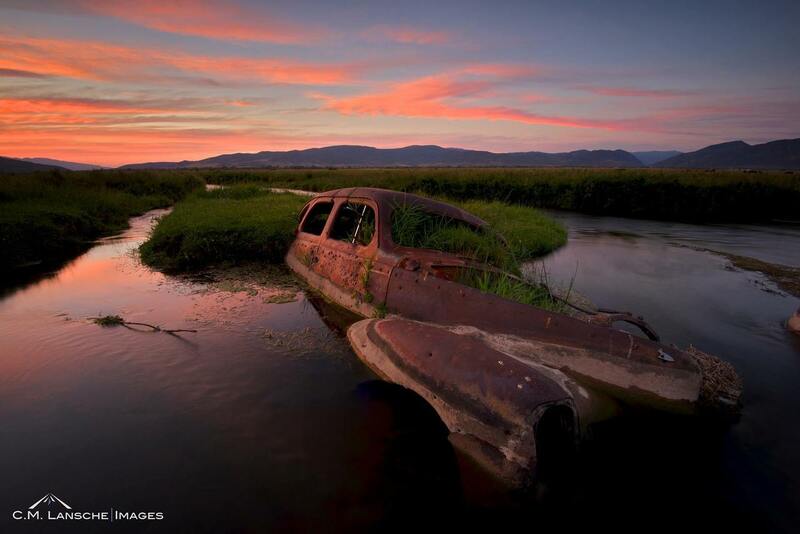 On December 20th that year, President Richard Nixon established the U.S. Environmental Protection Agency (EPA). In the strip mine fight, just after Christmas 1970, West Virginia’s Secretary of State, Democrat John D. “Jay” Rockefeller announced that he would seek a ban on the surface mining of coal in West Virginia, with bills to that end introduced in the legislature in late January 1971. At the federal level too, by July 1971, West Virginia’s Congressman, Democrat Ken Heckler, had introduced legislation in the U.S. House of Representatives to ban surface coal mining. In February 1972 the Buffalo Creek disaster in West Virginia occurred. In the upper reaches of the Buffalo Creek watershed in Logan County, West Virginia, a series of large coal slurry waste gop impoundments burst after heavy rains, releasing a tidal wave of coal waste water on more than a dozen downstream communities. More than 125 people were killed, with at least 1,000 more injured and 4,000 left homeless. Upstream strip mining and mine wastes were implicated as contributing factors. That's a Ford... Galaxie? 7 Liter? Able to administratively run a small business with basic accounting, purchase orders, and invoicing, who can maintain close working relationships with both the vendors and customers. Whether it’s full restorations, numbers-matching rebuilds or custom fabrication required, our friends at AMD Installation Center/Classic Muscle Metal are actively seeking talent above the average enthusiast. 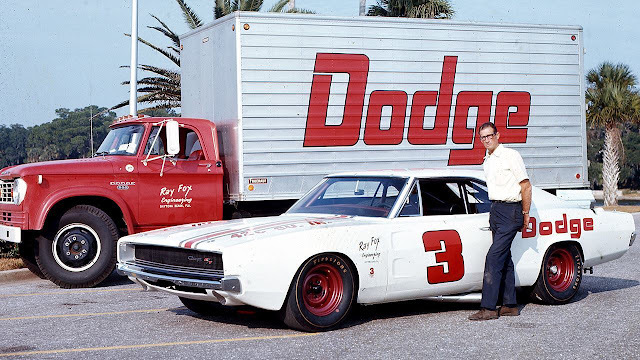 The company has been in the business of building and restoring Mopars for nearly 20 years, and the opportunity to work for them as an Auto Body Technician or a Fabricator has come now. 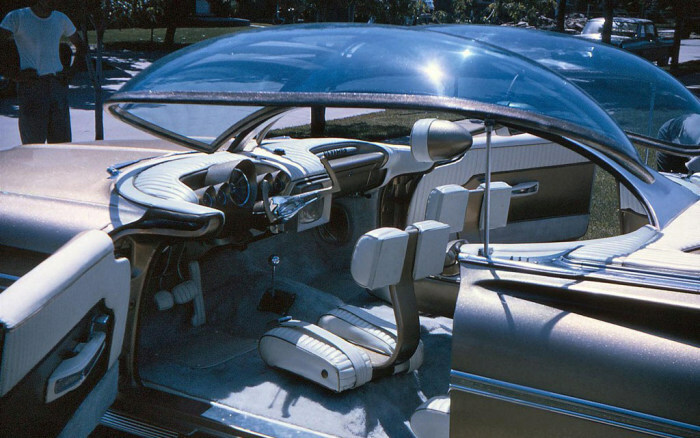 “We are considered to be pioneers in this business, and are the only shop in the US that focuses on just the body shell and nothing more,” the company said in its release. Moreover, the company is looking for someone who is comfortable working Monday – Thursday, forty hours a week, at four ten-hour days. Lastly, a high aptitude in general metal work, such as sheet metal fabrication, sheet metal gaping body panels and understanding deadlines are just the beginning. Polluting the land with heavy metals, petroleum products like grease and oil, and toxic materials like battery acid.... it takes it's toll. 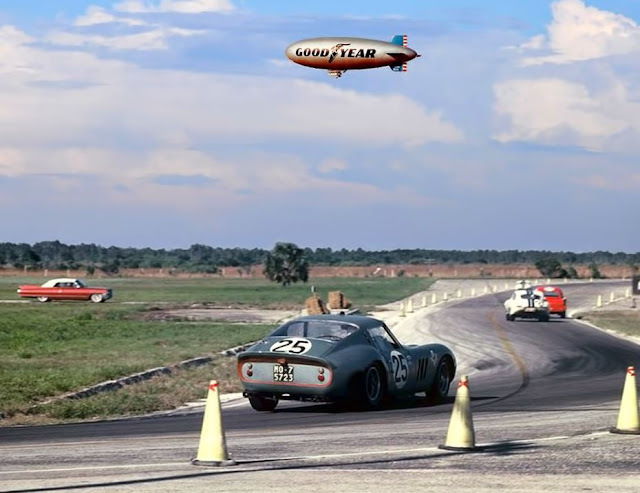 whoa, this is a flashback, anyone remember roads being lined with posts strung together with cable? wow, that bumper jack needed a step up to get the big ol N50 off the ground! 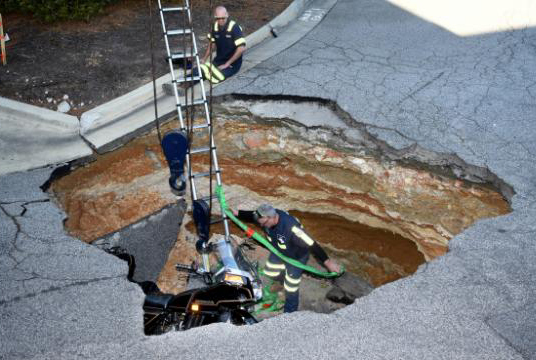 I can't even figure out what possibly caused this! going on or coming off the carrier? 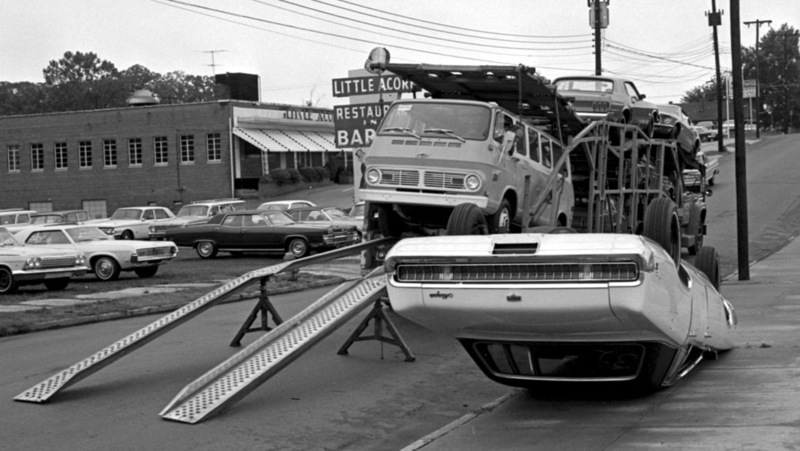 but isn't that a 72 Dart or Demon on the left? 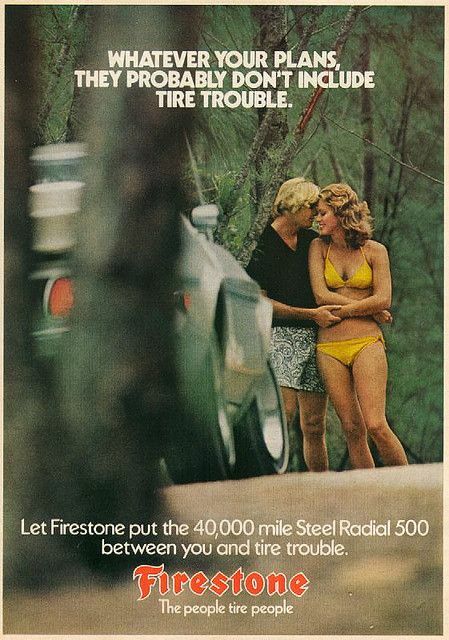 The back story to it, well, I didn't know it, I just dug the guy looking at the flat tires, the kids laughing like they let the air out of the tires, and the possibility that the parent talking the photo was deliberately catching the upset sportscar owner learning his fun day toy was decommissioned. 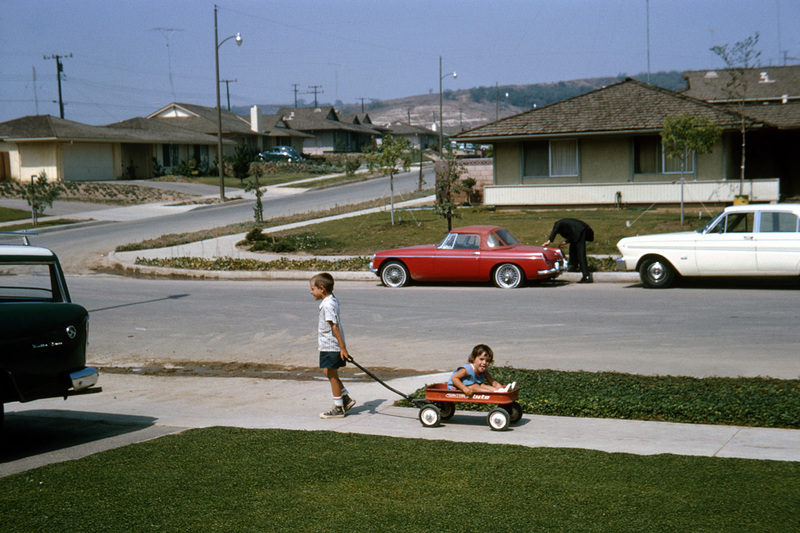 Maybe the person taking the photo was pissed the sports car guy was driving fast through the block where the kids can't be kept off the streets. Yeah, some parents lose their marbles over cars on streets, instead of building a fence to keep their monkeys in the yard. The backstory: Diamond Bar, California, August 1965. 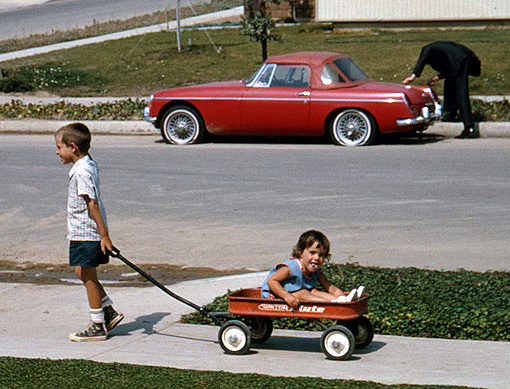 That is my dad out in front looking at my oldest sister's MG. The MG had been slashed to bits... the tires and the tarp. 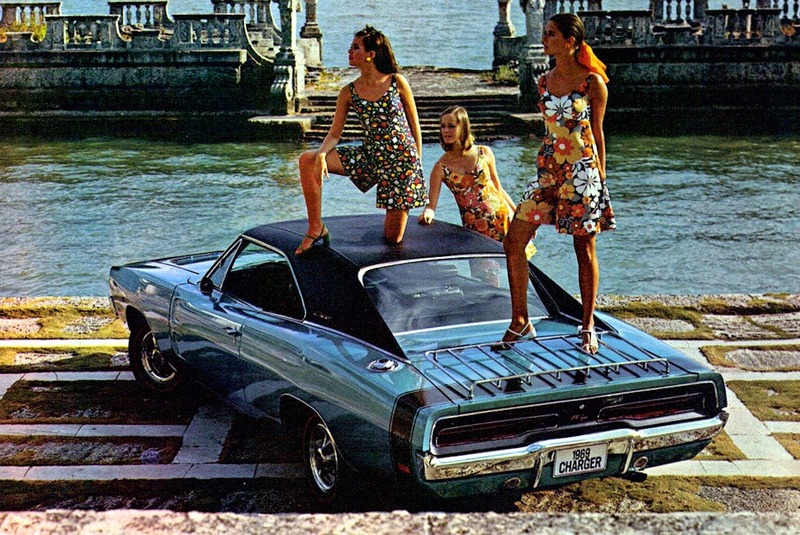 We were going to the beach and she parked the car at the church. 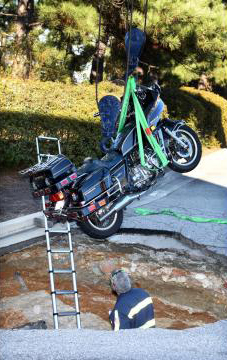 While we were getting ready to go, there was a terrible accident on Diamond Bar Blvd, which she witnessed. When the police came, she told them who's fault it was. When they left, we all went to the beach. When they got back from the beach the MG was vandalized. We knew who did it, but could not prove it. 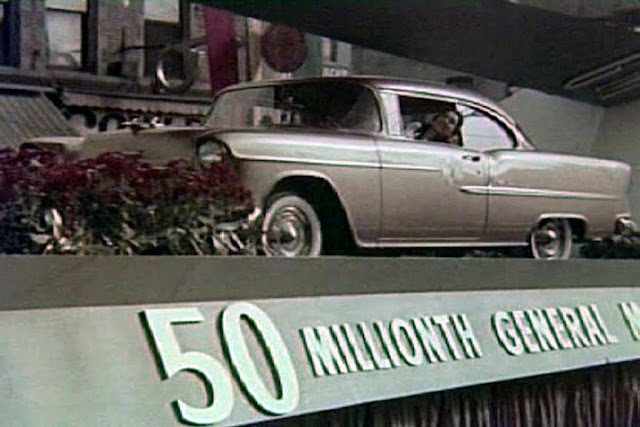 the 50 millionth GM vehicle produced, was dubbed "The Golden Chevrolet." No one knows where the gold '55 is or what happened to it. Assembled with the greatest of care at the Chevrolet plant in Flint, Mich., the golden chassis and gold-painted body were mated up and the special car was driven off the line at 10:00 a.m. on Tuesday, Nov. 23, 1954 by Chevrolet GM Thomas Keating, after which he handed the keys to GM Chairman Harlow Curtice. Most high-ranking GM officials and a number of civic leaders were present. 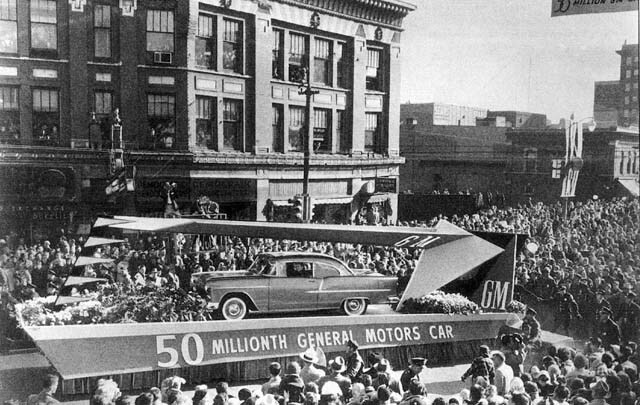 After a brief ceremony, the car was loaded on a float and towed through Flint, much to the delight of onlookers who had packed the streets to see the special Chevy and all the celebrities who were being hauled behind the milestone car in new GM convertibles. But then Chevrolet commissioned the construction of 5,000 gold-painted Bel Airs to commemorate the 50-million-vehicle performance by itself and all its sister divisions. Naturally, the chrome, stainless and aluminum pieces would remain in their normal state ... no more ultra-expensive gold plating. In addition, possibly to preserve the sanctity of the very special Sport Coupe, all 5,000 commemorative models would be four-door sedans. And they could have any combination of equipment, including engine and transmission. 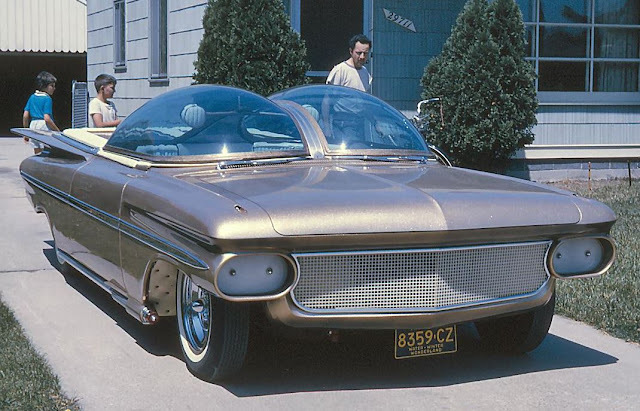 The Chevrolet Bel Air two-door hardtop including its chassis was painted Anniversary Gold and had 716 trim parts plated with 24-carat gold along with a duplicate set of replacement parts for repairs if necessary. The interior was color-keyed to the exterior and had the 50-millionth commemorative medallion made for the event attached to each door panel. 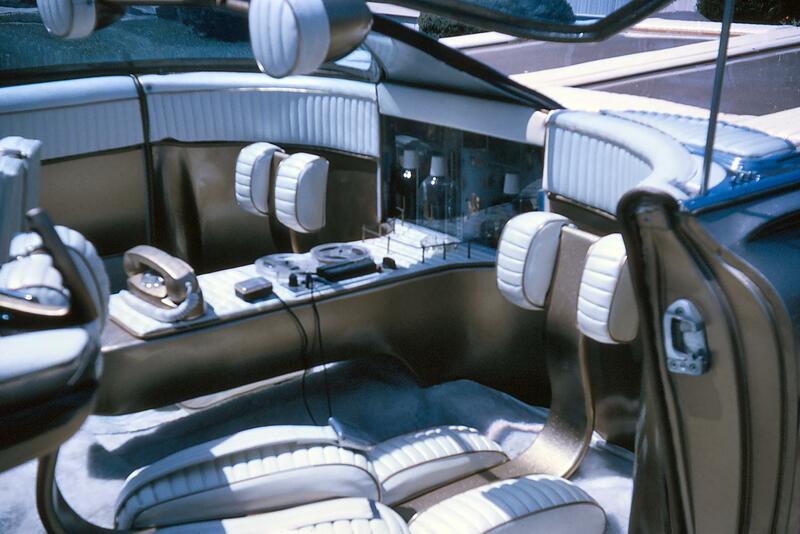 Chevrolet also offered the Anniversary Gold paint color as a limited option (reportedly just 5,000) for four-door models only. The 50-millionth car not only appeared at the “Golden CARnival” parade in Flint, but also at the GM Motorama. 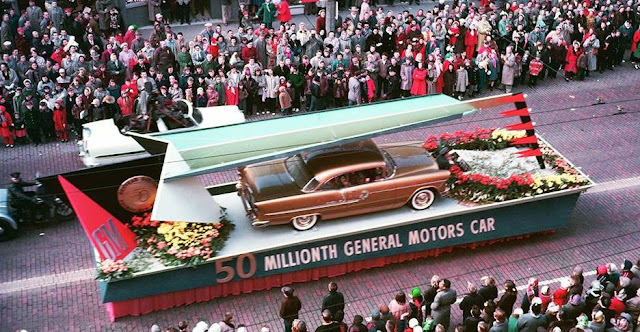 General Motors even painted one of their diesel locomotives in Anniversary Gold with the special 50-millionth car logo as part of the celebration. The unique Anniversary Gold Bel Air two-door hardtop became privately owned at some point after its days of generating publicity for GM came to an end, and this new owner had a different 1955 hardtop he was planning to restore. He learned of some guys who were building another 1955 hardtop into a race car so he to see it. 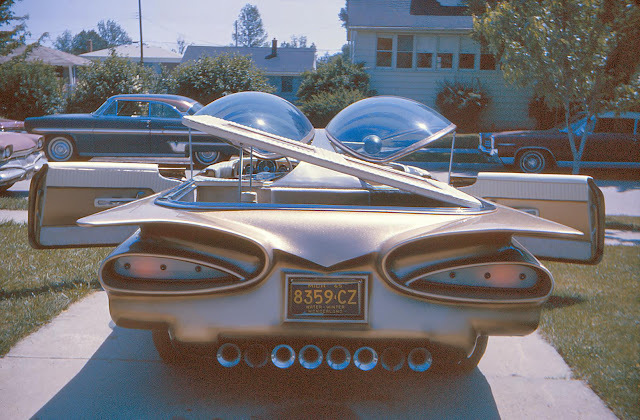 Extensive modifications were nearly underway when he found it to be in better condition than the car he had and planned to restore, and the gold side trim and gold hood ornament bird was still on it. The rest of the trim parts were inside the trunk. Since this car in good condition was about to get chopped, he suggested swapping cars, so he could restore a the better one and they could cut on the rusty one. 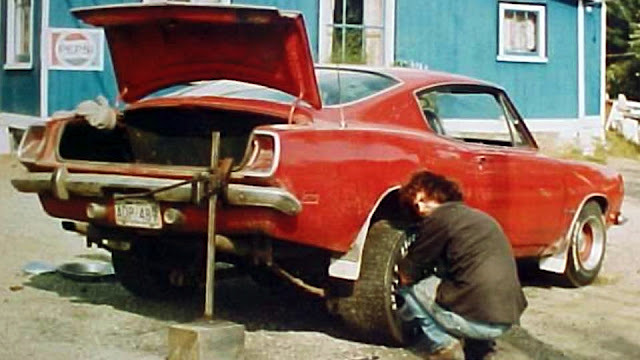 After getting the car home and beginning the dismantling process, he also found a special plate on the firewall, so he called Tom Trainor who worked for GM for 30 as a Chevy hobbyist. 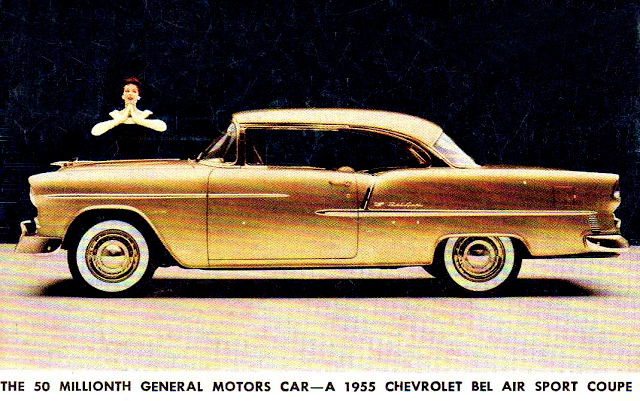 Tom found that the VIN on the Bel Air matched that of the 50-millionth GM car. 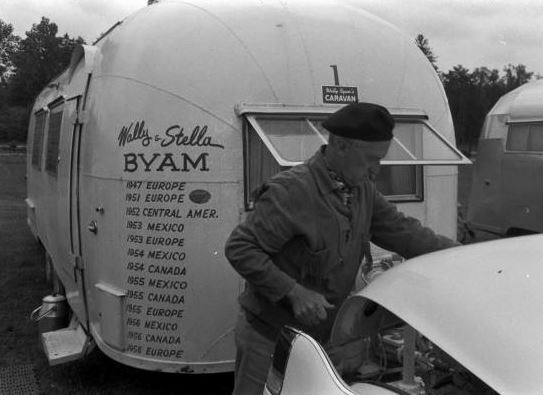 The guy that owned it is Bill Edney, of Columbus, N.C. who passed away Nov. 2011, and was a founding member of the Carolina Nomad Club. 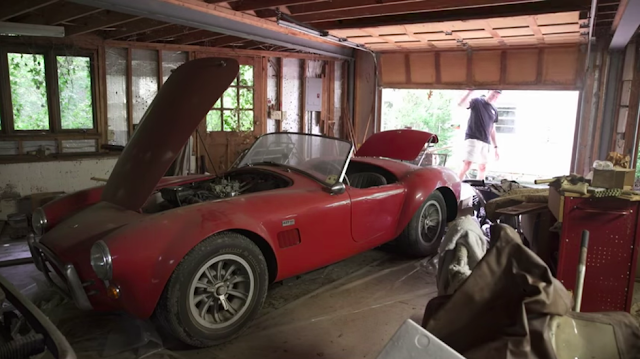 Bill saw the car was going to become a race car. The car was Black and white and was offered for 400 dollars. It had factory A/C and power everything. 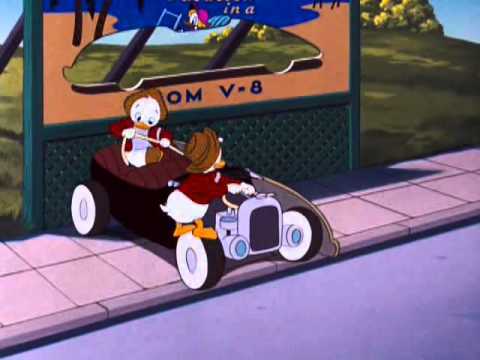 It was later that he learned that there was only one sport coupe done and its the gold one in the parade and in the promo movies. But Bill started the replating, buying nice NOS trim to do it with. 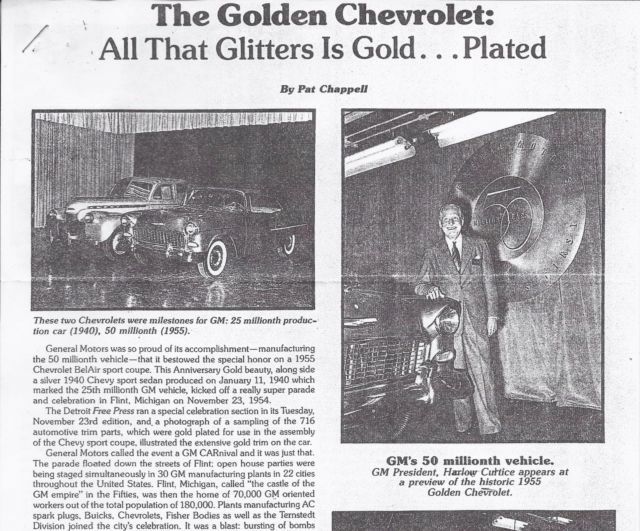 The golden anniversary 55 hardtop came to GM's attention and in 2002 GM offered to restore the car for him if they could use it for promo for the 2005 anniversary but he was afraid that he would not get it back. 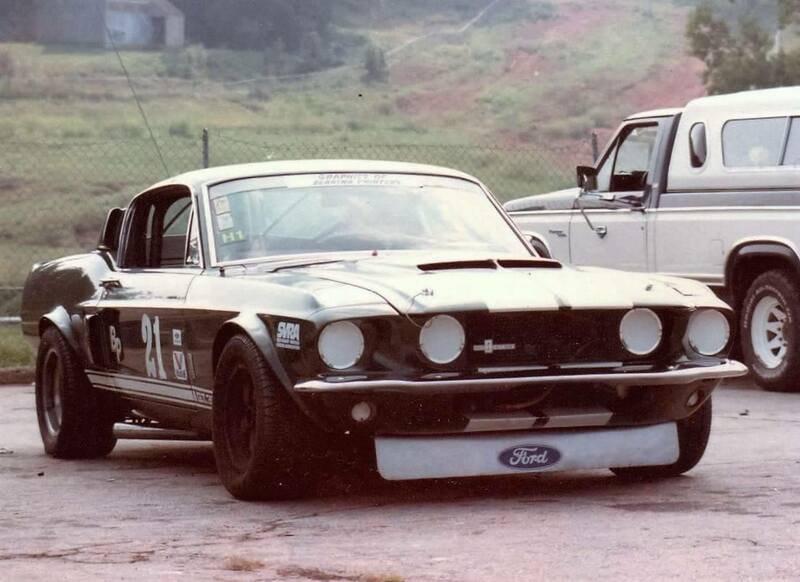 So it was still sitting and awaiting restoration. As a side note, an original license plate that was on the car was on ebay a couple years ago. It had 50 000 000 in raised numbers and there were some penciled notations on the back of the plate. It took less than a decade to cross the 75 million threshold in 1962, and just five years to reach 100 million. 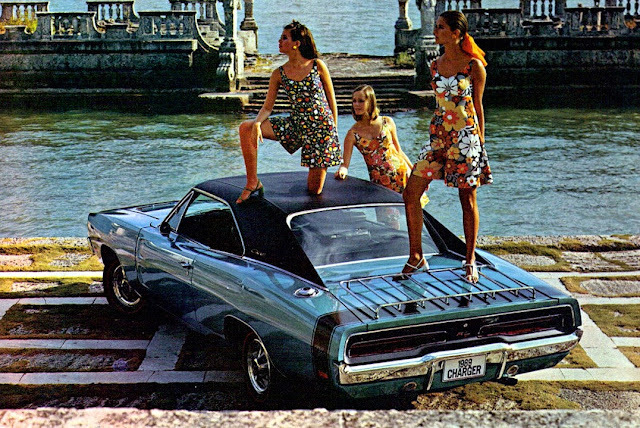 GM was the largest automaker in the world in 1967, providing jobs for 740,000 people in America, who built cars for 50% of the American market. 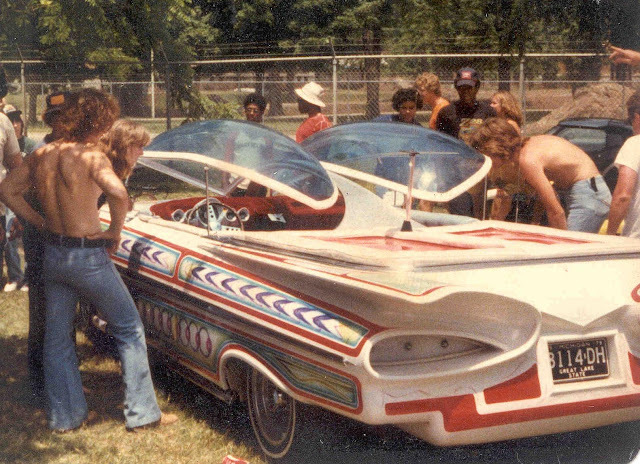 at the Car Craft Street Machine Nationals in Indianapolis in 1979. Quite a nice Plomb collection!